The weekend of April 17th and 18th (and 19th) we were honored to provide Turnbull manufactured firearms to the winners of the April NASCAR Sprint Cup Series at Texas Motor Speedway. We manufactured a custom rifle for the winner of the pole position race and custom pistols for the winner of the primary NASCAR race. 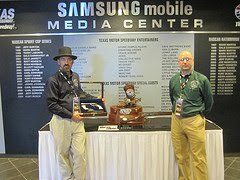 Before the races, we were fortunate to be able to attend the Texas Motor Speedway proclamation day in Fort Worth and give people a sneak peak of the commemorative firearms Turnbull would be presenting to the winners of that weekend’s races. While we were there we met Texas Governor, Rick Perry; Fort Worth Mayor, Mike Moncrief; President of Texas Motor Speedway, Eddie Gossage; NASCAR racer Bobby Labonte; and others. We were impressed that they blocked off some main streets in downtown Fort Worth to hold the event! The first race was the pole position race on Friday. Always an unpredictable race where potential winners can appear with each new race time, we were pleasantly surprised when Tony Stewart jumped from about the 11th position to 1st and won the race. After the race, Tony drove his car up and we presented the commemorative rifle. Tony was able to shoot the rifle off in the winner’s circle. The big race, originally schedule to take place on Sunday, April 18th was postponed to Monday the 19th due to rain. The race was exciting and even though the weather was threatening even on Monday, the race went on as planned. It did end with a crash with only about 20 laps to go, but luckily no one was hurt! Denny Hamlin was the winner of that race and he received the two Turnbull manufactured pistols. We presented the pistols to Denny who also fired them off in the winner’s circle. Look for Turnbull again at the IndyCar Series Race at Texas Motor Speedway on June 5th where we will be shooting off another set of commemorative pistols. We’ll also be presenting an additional set of commemorative shotgun and pistols to the winners of the AAA Texas 500 at Texas Motor Speedway on November 7th.